Swell questions ranging from Gaye Bykers On Acid to Thomas the Tank Engine and Friends. The Picture Round is on Euro 2016 Badges and the Wild Card is a belter about Berkamp! Q03. Which part of the body swells by up to 10% as the day progresses? Q14. From which English City did the 80s psychadelic rock band Gaye Bykers On Acid hail from? Q28. In which sport can you perform a Randolph, a Rob-Roy and a Rudolph? Q37. On what island would you find Thomas the Tank Engine and friends? Here’s a low-res sample of the Euro 2016 Football Badges Picture Round, click for a higher resolution version. The Picture Round download is a two page high quality PDF with the answers on page 2. 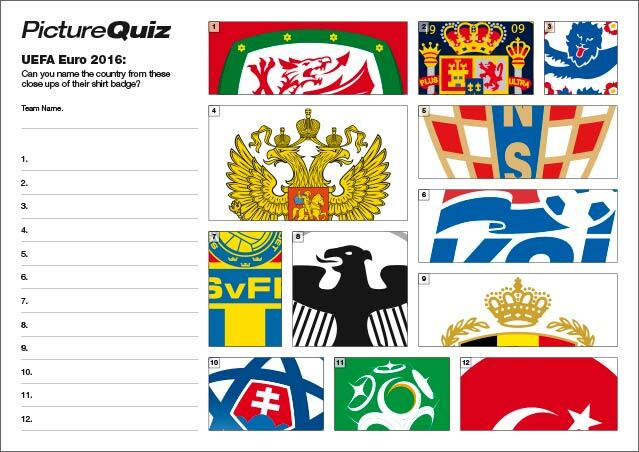 Quiz 48’s Picture Round is can you name the country from these details of their Euro 2016 Badges? The Wild Card for Quiz 048 is a belting question about the former Arsenal striker Dennis Berkamp.